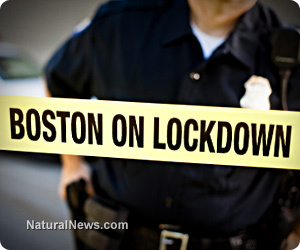 It has been about two months now since multiple pressure cooker bombs went off near the finish line of the 2013 Boston Marathon, an event that triggered a massive show of police state force as hordes of armed SWAT troopers marched the streets of suburban Boston in search of the patsies. And a recent Boston Globe report openly admits that the entire charade was completely staged, having been planned months in advance as part of a Department of Homeland Security (DHS)-funded exercise targeting patriots and militiamen as terrorists. An attempted cover for the actual false flag event that allegedly killed three people back in April, the DHS-funded drill, known as "Operation Urban Shield," was intended to take place during the summer, according to the Boston Globe - that is until the "real" event beat it to the punch. But the drill itinerary so closely resembles what actually occurred the day of the bombings that even the mainstream media source responsible for bringing it to light could not help but point out this incredible "coincidence," which bears all the classic marks of a government-initiated false flag attack. "The scenario had been carefully planned: A terrorist group prepared to hurt vast numbers of people around Boston would leave backpacks filled with explosives at Faneuil Hall, the Seaport District, and in other towns, spreading waves of panic and fear," explains the Boston Globe. "The hypothetical terrorist group was even given a name: Free America Citizens, a home-grown cadre of militiamen whose logo would be a metal skull wearing an Uncle Sam hat and a furious expression." Backpacks, hats with strange skull emblems, non-Islamic fall guys to take the blame - all of these elements just so happened to be present the day of the actual attacks, which is quite interesting in light of the fact that false flag events of the past also coordinated with almost identical drills that were intended to be conducted around the exact same time. The 9/11 terrorist attacks in New York are a perfect example of this, as a nearly identical drill involving terrorists flying planes into buildings was set to occur at the exact same time. "On 9/11, an agency of the Department of Defense and the CIA was conducting a terror scenario in which an imaginary airplane from Washington's Dulles International Airport was to crash into one of the four towers of the suburban campus of the National Reconnaissance Office (NRO) in Chantilly, Virginia, just a few miles from the Pentagon," explains Christopher Bollyn in his book, The Terror Drills That Became Real: 9/11, the London Bombings & the Sinking of Estonia. "When the terror scenario became real in New York and at the Pentagon, the NRO exercise was cancelled and nearly all its three thousands employees, the people who operate the nation's 'eye in the sky,' were sent home." As it turns out, false flag attacks like 9/11 and the Boston Bombing are a common tactic that corrupt government's use to stage an event, blame the appropriate patsies, and ultimately foment war or some other monumental social change. With 9/11, George W. Bush was able to implement the Patriot Act, for instance, which brought about the creation of the very same DHS responsible for funding the Boston Bombing false flag attack.